This is certainly one of the “Best Pictures” ever made, says De Soto-owner Walt Disney. And who are we to argue with a man who never misses? With his artist’s eye for line and color, Mr. Disney likes his De Soto for symmetry, color symphonies between upholstery and enamel, and sheer, poetic smartness. The big wide seats provide room enough for six well-fed adults, and we don’t mean dwarfs. Mr. Disney is a practical man, and he wanted the convenience of De Soto’s new Handy-Shift, which stems from the steering post, directly beneath his talented fingers. Also, no trunk bulge mars De Soto’s youthful figure; yet, under that smooth streamlining is a huge luggage compartment, 23 cubic feet, no less. There’s no need for back-seat help, either, for ingenious lights on the speedometer warn the most preoccupied driver by turning from green to amber at 30, then flushing an indignant red at 50 and up. De Soto is easy on the nerves; easy on the eye; easy on the budget. 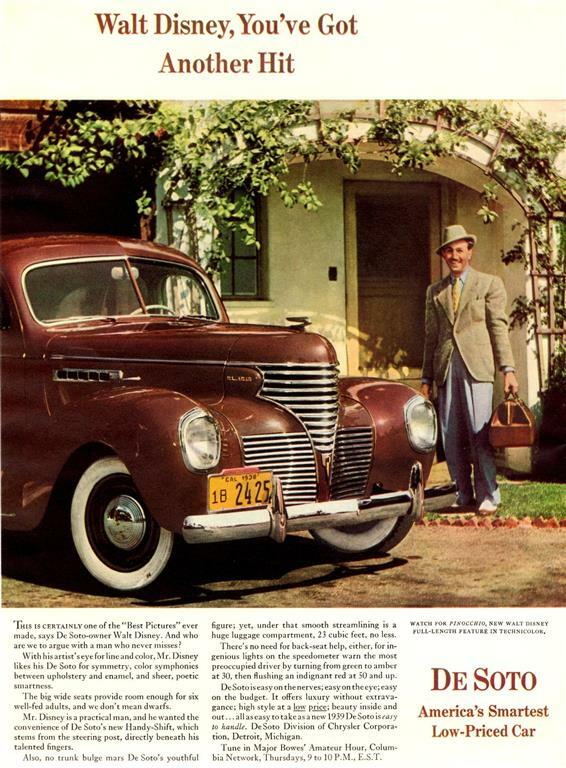 It offers luxury without extravagance; high style at a low price; beauty inside and out… all as easy to take as a new 1939 De Soto is easy to handle. DeSoto Division of Chrysler Corporation, Detroit, Michigan. Tune in Major Bowes’ Amateur Hour, Columbia Network, Thursdays, 9 to 10 P.M., E.S.T. Watch for Pinocchio, new Walt Disney full-length feature in Technicolor. This entry was posted in Walt Disney history and tagged advertisements, cars, Walt.